Western Watersheds Project, a conservation organization based in Hailey, has launched an effort to improve environmental conditions in Copper Basin, which it contends have been degraded through excessive cattle grazing. 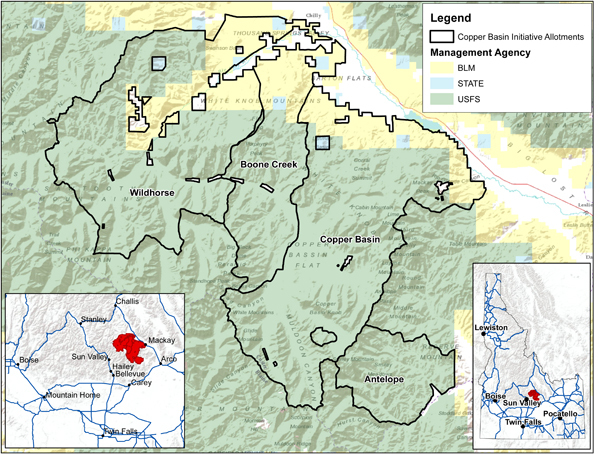 The organization, which works on public lands issues throughout the West, announced its Copper Basin initiative in its spring 2014 newsletter. The basin is east of the valley over Trail Creek Summit. Part of the allotment area is within a proposed Boulder-White Clouds National Monument. Hedberg contended that there are dramatic differences between the grazed and not grazed areas in the basin. He said inspection of the land during a tour of the area last August showed cattle had been pulling up grass by the roots rather than just biting it off, indicating a scarcity of forage for the animals. A flier distributed by the organization states that the initiative will focus on four grazing allotments that cover 380,000 acres, 85 percent of which is managed by the U.S. Forest Service. The document states that the agency has never conducted environmental assessments on two of those allotments and the EAs on the other two occurred 41 years ago. However, Salmon-Challis National Forest Public Affairs Officer Amy Baumer said EAs on one of the allotments was done in 1980 and on two others in 1992. She said an allotment management plan was conducted for the fourth, called the Wildhorse allotment, in 1970, though no EA has been done. According to the forest website, an environmental assessment is under way on the 47,700-acre Wildhorse allotment, and is scheduled to be completed by December. According to the Western Watersheds flier, the organization intends to closely monitor grazing in Copper Basin and in the Big Lost River watershed with respect to compliance with federal laws such as the Clean Water Act and the National Environmental Policy Act. “We want the environmental laws that are in place to be enforced,” Hedberg said. He said an intern will monitor water quality in the streams this summer, and that data will help inform ranchers, agency employees and the public. Hedberg said Western Watersheds Project’s ultimate goal for the area is a voluntary buyout of grazing permits there, which he calls a “win-win-win” for the environment, the public and ranchers who are struggling to turn a profit. Hedberg said permit buyouts in other parts of the West have cost between $5 and $10 per acre. At those rates, a buyout of all the Copper basin allotments could cost up to $3.8 million. Hedberg said his organization already has some interested donors on board.